A battle between perinnial welterweight contenders Demian Maia (23-6, 17-6 UFC) and Carlos Condit (30-9, 7-5 UFC) will headline in a five-round bout in the UFC's return to Vancouver on August 27 for UFC On FOX 21. The UFC announced the news on Tuesday after an initial report by Canadian sportswriter Neil Davidson. 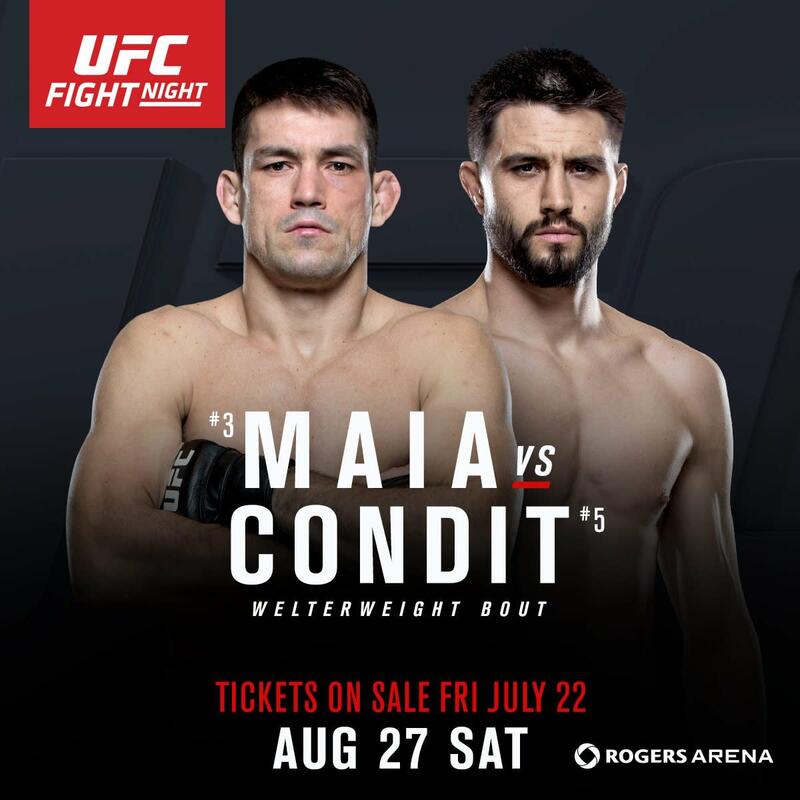 Maia and Condit were scheduled to meet at UFC 202 on August 20, but the bout was shifted to a week later as the Vancouver card was still searching for a main event. Condit, a former Interim UFC Welterweight Champion, returns following a "Fight Of The Year" candidate bout against Robbie Lawler for the UFC Welterweight Championship at UFC 195 in January. Condit lost the fight by a razor-thin split decision, and talked about retirement following the bout. The retirement talk can wait as he looks to get another title shot. Maia will enter the bout having won five straight fights and is coming off a dominating submission win over Matt Brown at UFC 198 in May. During his current streak, he also has scored wins over Gunnar Nelson, Neil Magny, Ryan LaFlare and Alexander Yakovlev. A sixth straight win over Condit could secure Maia his first title shot since moving down to 170 pounds. In addition to the annoucement of the Maia vs. Condit main event, the UFC announced three additional bouts. Sam Alvey will fight for the third time in just over two months as he takes on Kevin Casey in a middleweight bout, Shane Campbell will welcome the debuting Felipe Silva in a lightweight bout, and a middleweight bout between newcomers Adam Hunter and Ryan Janes. UFC Vancover Observer Picks: Carlos Condit, Paige VanZant, Anthony Pettis, more!